The Africa, Caribbean and Pacific (ACP) negotiating mandate for the Post-Cotonou Partnership Agreement with the European Union was unanimously adopted at the 107th Session of the ACP Council of Ministers which took place in Lomé, Togo, on 30th May. Central to the discussions in Lomé were the revision of the Georgetown Agreement and the adoption of an ACP negotiating mandate for the Post-Cotonou Partnership Agreement with the European Union. The Council meetings were crucial to opening new negotiations with the European Union (EU), in the quest for the attainment of sustainable development in all ACP countries. Apart from the discussions on the future of the ACP Group and its relations with the European Union, the 107th Session of the ACP Council of Ministers addressed strategic matters such as repositioning the ACP group as a more effective global player in order to respond better to the needs and aspirations of its ACP Member States. Ambassador Faure, Secretary of State for Foreign Affairs in the Department of Foreign Affairs, heading the Seychelles delegation, made a presentation to the special session on this subject. Ministers also addressed ways of leveraging the principles of complementarity and subsidiarity between the ACP Group and the Regional and Continental organisations, sustaining financing of the Group and lastly advancing the climate change agenda in a repositioned ACP Group. Other key items on the agenda included commodities and trade issues, sustainable economic development, and development finance. In his interventions on these issues, Ambassador Faure wished for the inclusion of the fisheries sector to be featured under the Ministerial Consultation on Commodities given the importance of fisheries sector to Seychelles. He called on the member states to sign the instruments for the Joint Undertaking on the Customs Cooperation Agreement with the objective of increasing intra-ACP partnership and deepening integration. To note that only 13 countries, including Seychelles, out of the 79 have signed this agreement. The 107th Session of the ACP Council of Ministers was immediately followed by the 43rd Session of the ACP-EU Council of Ministers. The annual meeting of Ministers from the European Union and the countries in Africa, the Caribbean and the Pacific was an opportunity to hold fruitful and constructive discussions on the way forward for their future relationship and to take stock of the progress already made. The meeting, which took place in Lomé, Togo, was hosted by the President of Togo, Faure Gnassingbé and co-chaired by H.E. Ms Kamina Johnson Smith, Minister of Foreign Affairs and Foreign Trade of Jamaica and H.E. Ms Ekatarina Gecheva-Zahareva Deputy Prime Minister for Judicial Reform and Minister of Foreign Affairs of Bulgaria. The EU welcomes the adoption by the African, Caribbean and Pacific Group of States of its Negotiating Mandate, which will lead its members to start meaningful negotiations soon. This ACP-EU 43rd Session was crucial in taking preparatory steps towards the negotiations and underlined the importance the longstanding partners attach to their cooperation including after 2020. For her part, Senator the Honourable Kamina Johnson Smith, Minister of Foreign Affairs and Foreign Trade of Jamaica stated that the imminent expiry of the current Cotonou Partnership Agreement provides a unique opportunity for us to modernize our relationship that is fit for purpose and will help us together to refine our approaches to national and regional issues, and define our ability to contribute collectively to a stable and progressive international environment, leaving no one behind. As like-minded partners, the ACP Group of States and the EU agreed to increase their international cooperation in key areas, such as climate change, migration and throughout the upcoming UN Conferences this year. A specific calendar should be developed accordingly in the coming weeks. Further cooperation is expected in the area of inclusive sustainable growth as the EU and the ACP Group of States exchanged views on how to increase trade, strengthen investment and management of natural resources, addressing the vulnerabilities of ACP Countries and the situation of middle income countries and take appropriate steps in relation to issues of EU list of non-cooperative jurisdictions for tax purposes. Both partners reaffirmed their commitment to tackling climate change through a joint declaration in anticipation of the upcoming UNFCC 24th COP on Climate Change to be held in December 2018 in Katowice, Poland. The EU-ACP partnership is one of the oldest and most comprehensive frameworks of cooperation of its kind. 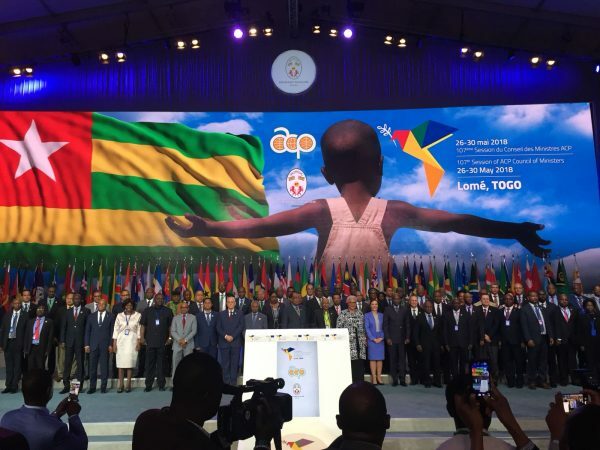 Uniting more than one hundred countries and over 1.5 billion people, the Cotonou Agreement governing EU-ACP relations is due to expire in February 2020.